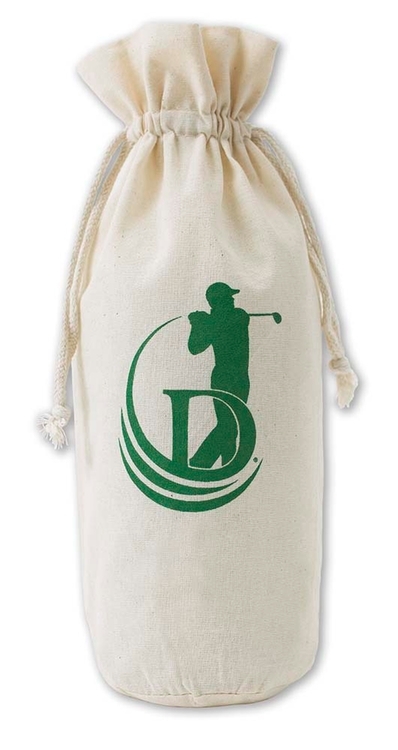 Satin Drawstring Bag * Double drawstring construction * Black satin * Satin ribbon drawstring approx 1.5" from top * Accommodates standard wine bottle easily * Includes 1 color imprint * Approximate dimensions 5 x 15"h * Imprint area 4 x 6"
Here is a classic promotional item that is sure to be used by recipients for years to come. 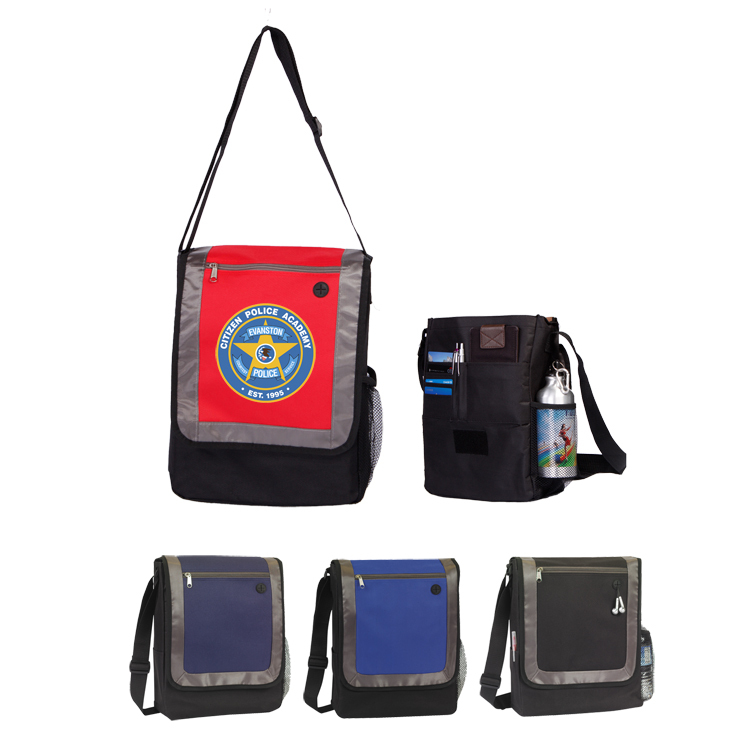 This Messenger Bag features a front zipper pocket and full organizer under flap so you can keep everything in order. With two side pockets and an adjustable shoulder strap, this comfortable and stylish bag is ideal for students and professionals alike. 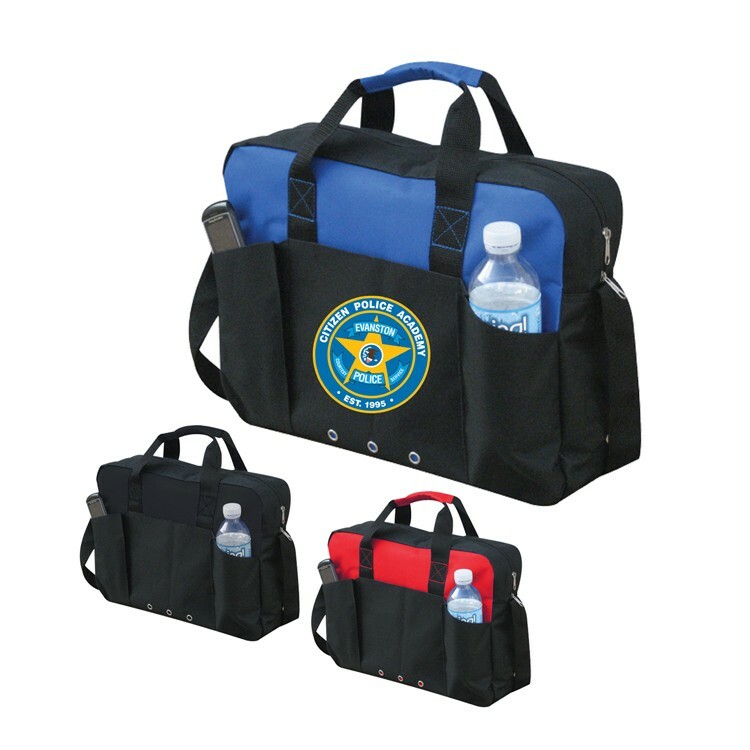 The adjustable shoulder strap can be adjusted in length from 29.5'' to 55''. Made of 600 denier. 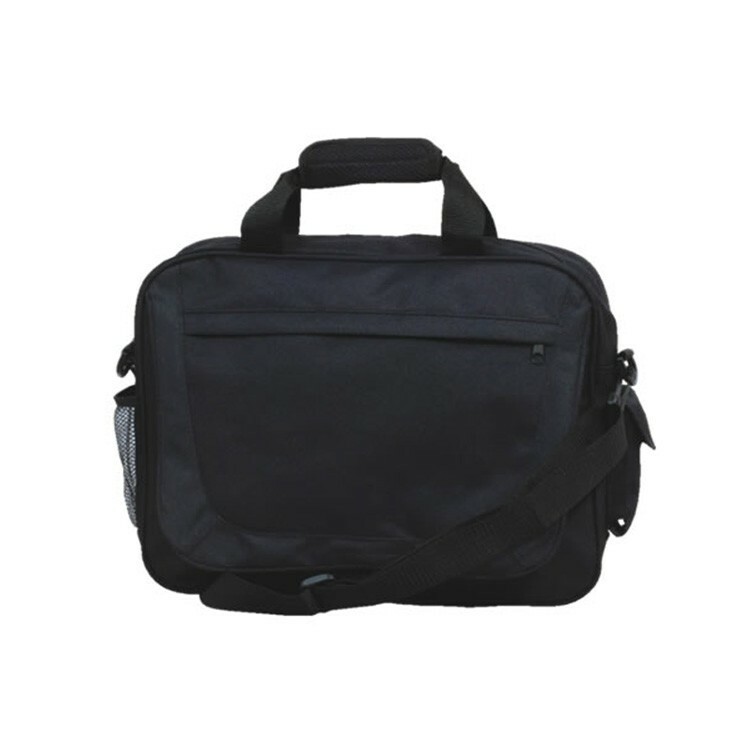 This Computer Messenger Style Brief features a padded compartment for your laptop so it will stay safe on the go! This bag has front zipper pocket for accessories and a full organizer inside to keep everything in order. 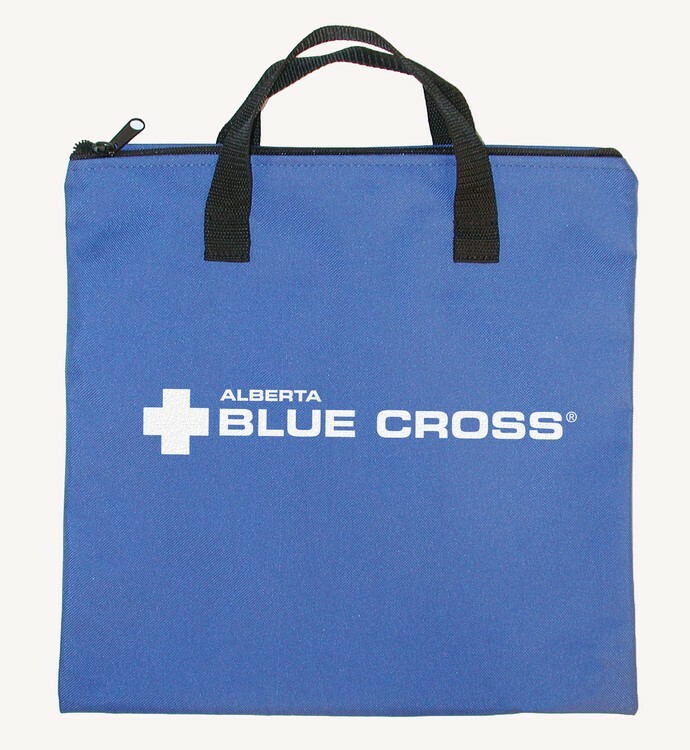 This bag features an adjustable shoulder strap that adjusts up to 54.5'' in length and a 14'' handle for comfortable carrying. Made of 600 Denier, you can be sure of this bag's durability. 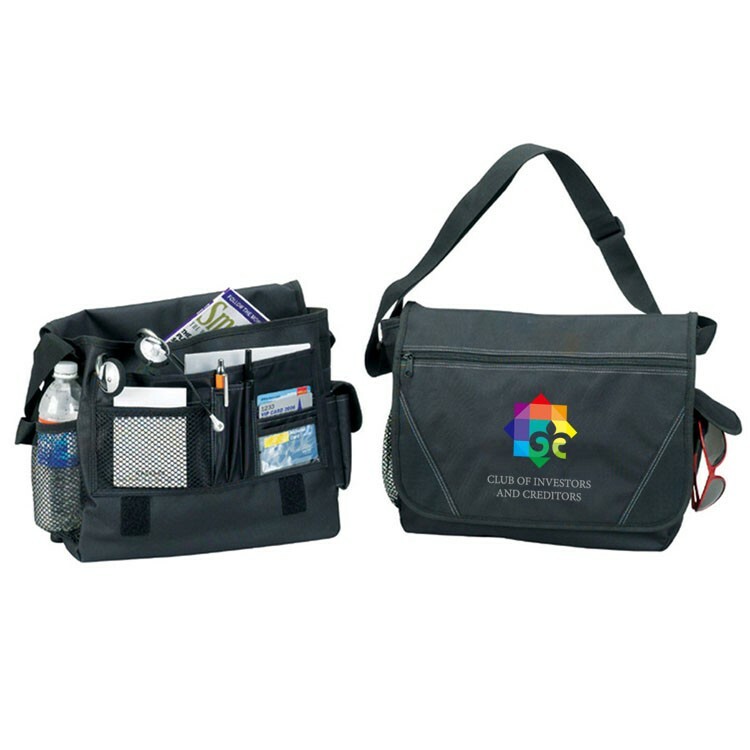 Put a unique spin on a classic product with this Deluxe Executive Messenger bag with diagonal front zipper pocket and full organizer under front flap. 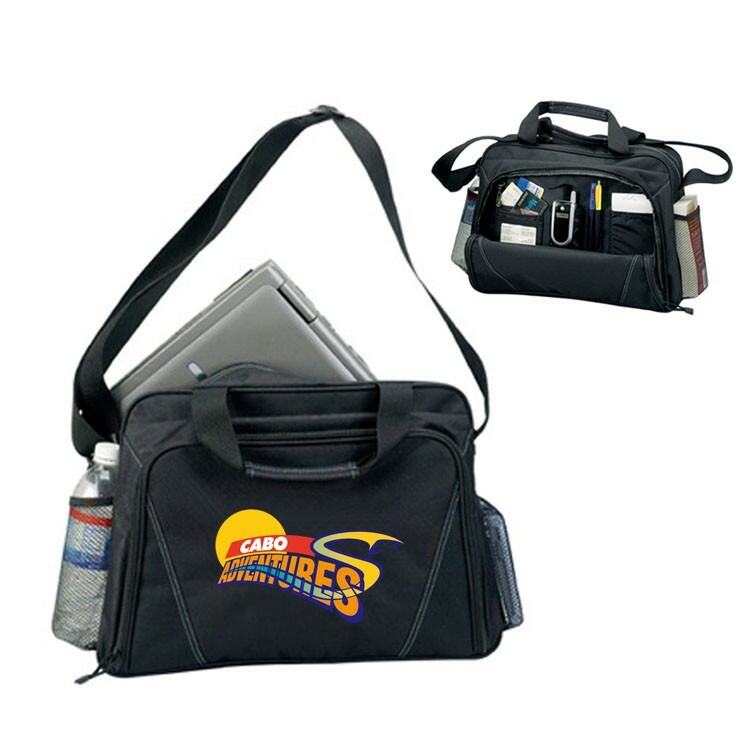 Featuring a side mesh pocket and an iPod port on front flap, you can take your accessories and tunes on the go! The metal hardware and adjustable shoulder strap give this bag a classic look. 600 Denier with leatherette trim. 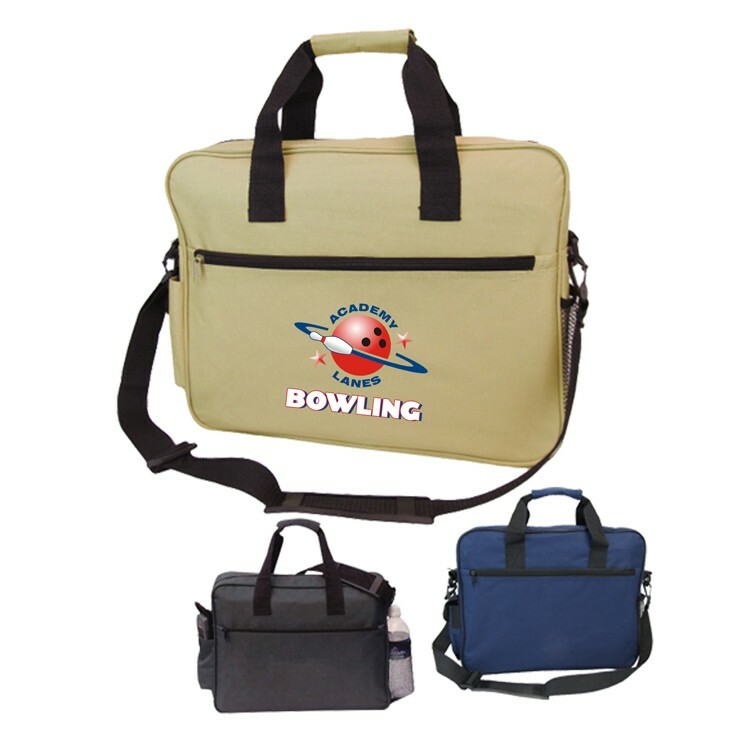 The adjustable shoulder strap can vary in length from 24.5'' to 45''. 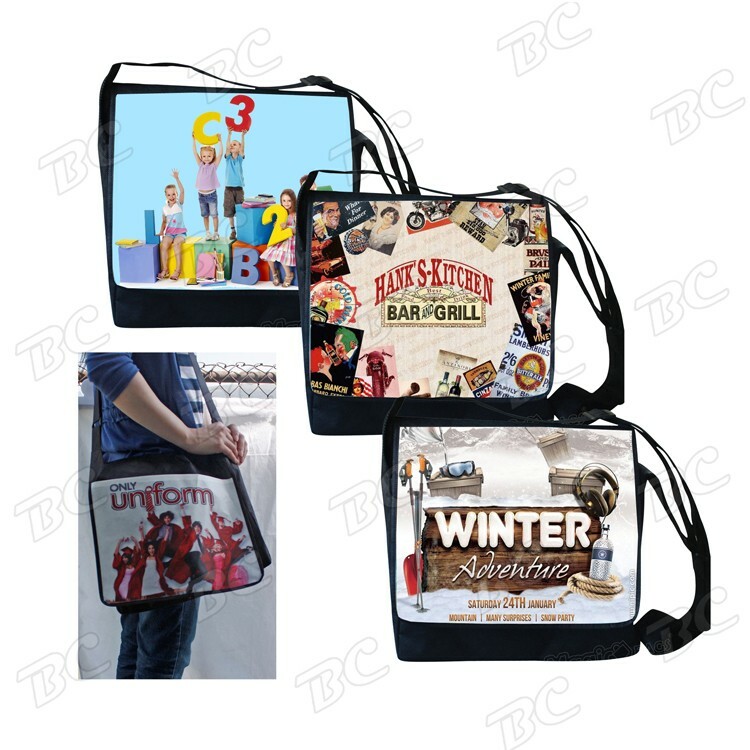 600D Polyester briefcase style tote bag. 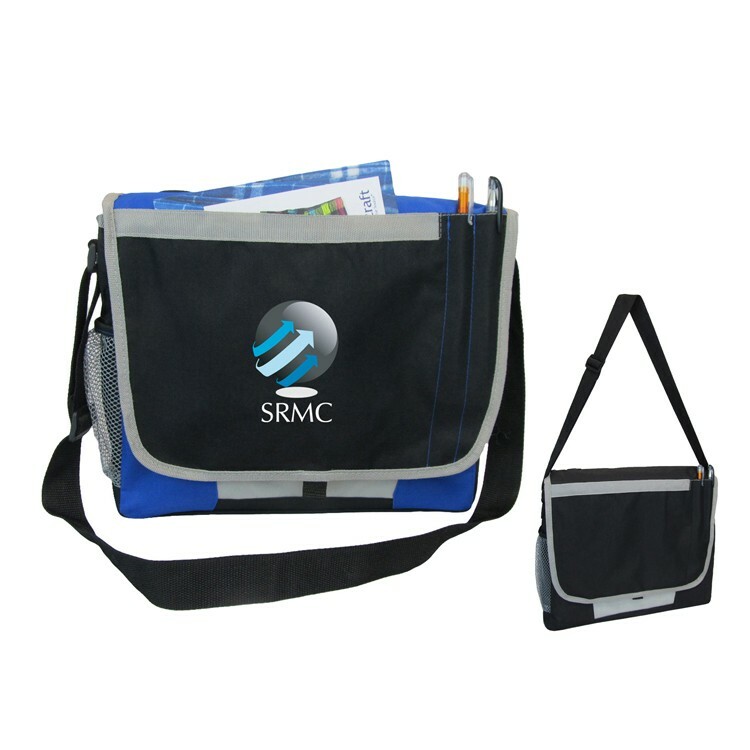 Zipper main compartment is perfect for documents, and features a large velcro closure front pocket. 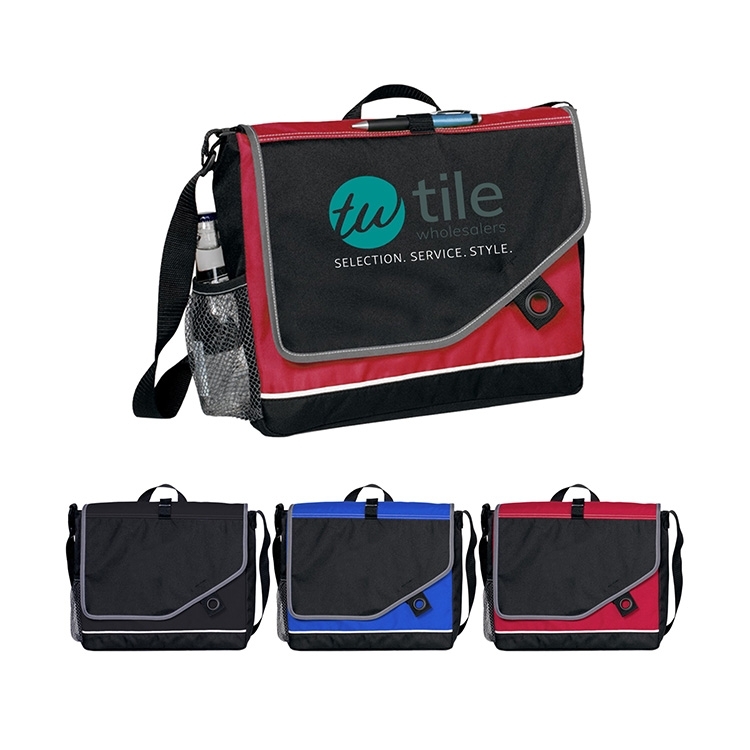 The On The Go Messenger Bag is completely customizable and comes in a variety of colors to choose from! 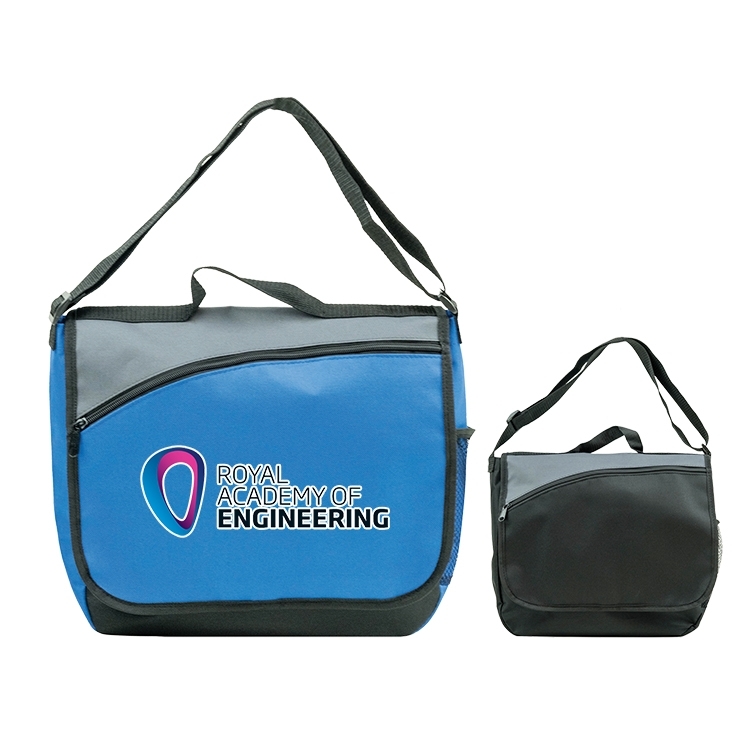 This bag features a front zipper pocket, double pen pockets, an open pocket under the flap and a Velcro strap gusset closure. The iPod port allows you to take your tunes on the go while the side mesh pocket is ideal for a water bottle. The carry handle and adjustable shoulder strap measuring 26'' to 50'' make for convenient carrying. 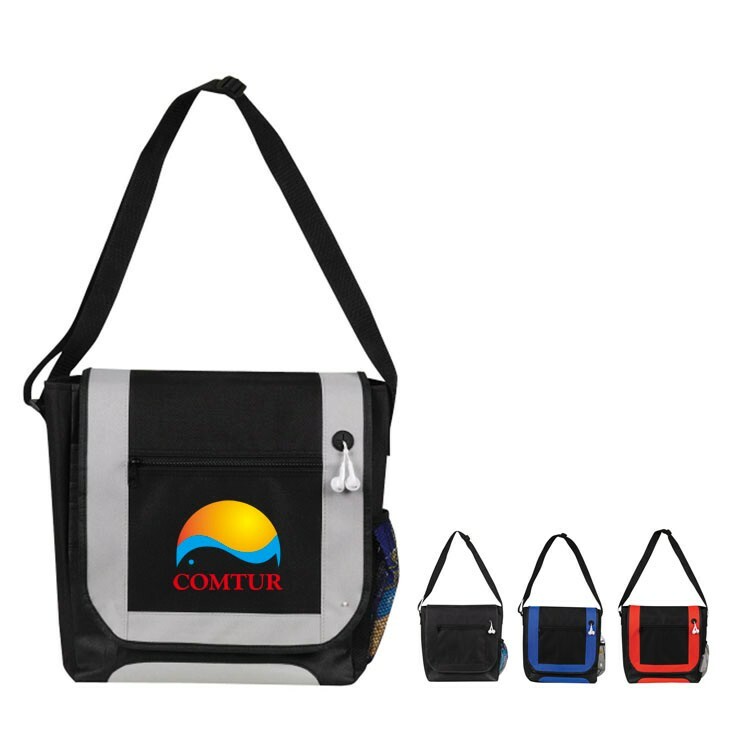 "Open main compartment with clipped flap closure Expandable main compartment Deluxe organizer under front flap includes multiple pockets and pen sleeves Front zippered pocket Padded top carry handle Detachable and adjustable shoulder strap." 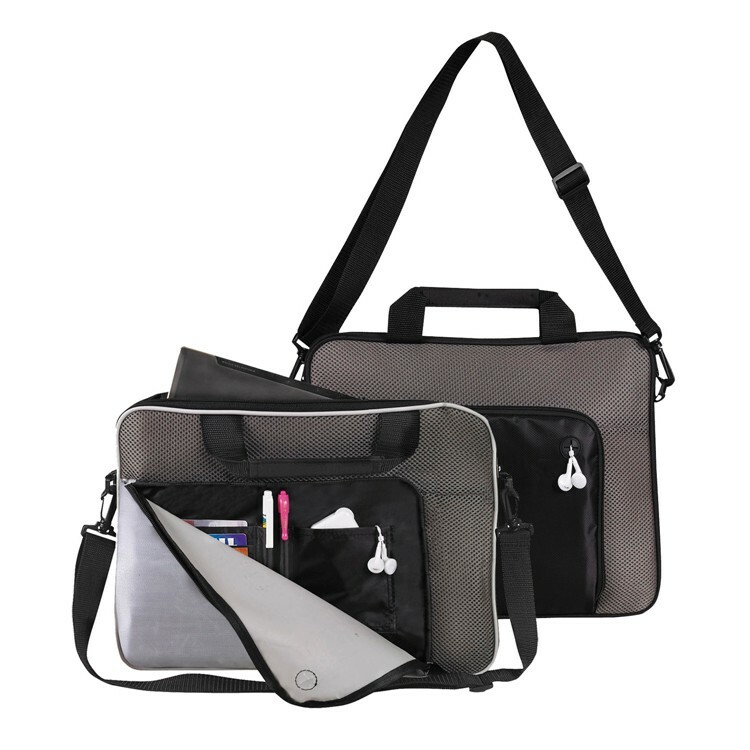 600 - Denier Polyester Top-opening main compartment for easy access Fully padded laptop pouch with Velcro closure Organizer section and ID window under front flap Elastic cell phone pocket and mesh pocket on the side. We do full color process, photo image and embroidery logo on this item. Keep your laptop safe with this Padded Notebook Briefcase. 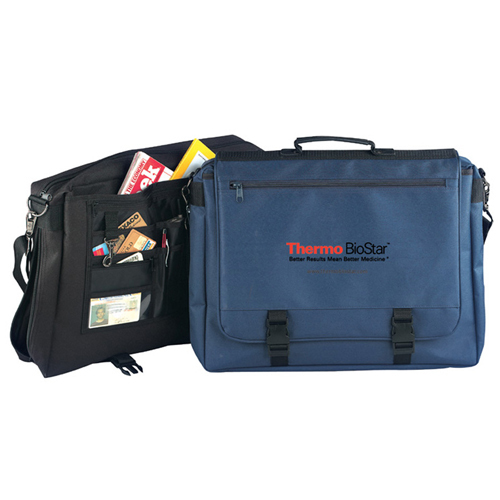 Measuring 13", this notebook briefcase has a main compartment, front zipper pocket with organizer, an iPod port and adjustable/detachable shoulder strap for convenient and comfortable carrying. 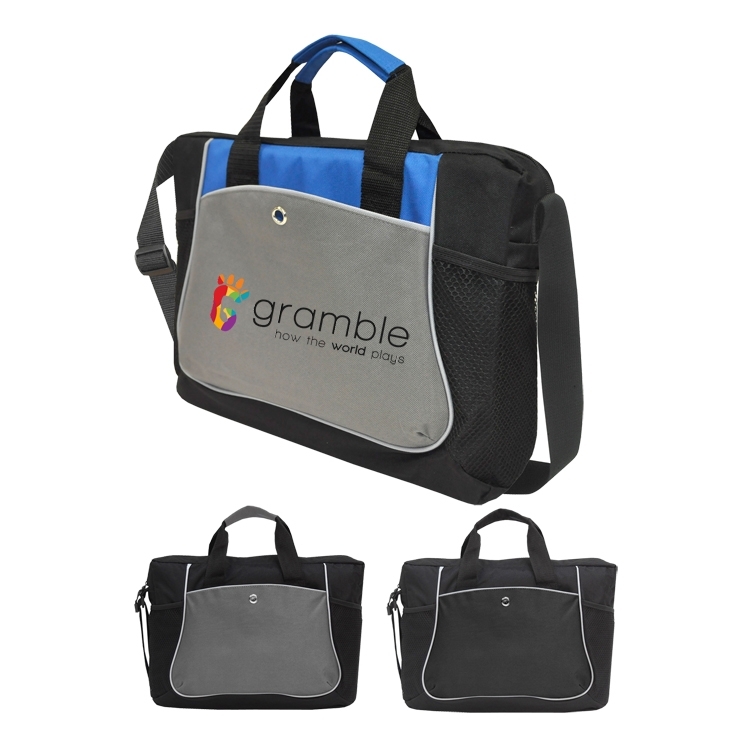 This bag fits most laptops up to 13", perfect for tablets. The adjustable shoulder strap lengthens up to 54''. 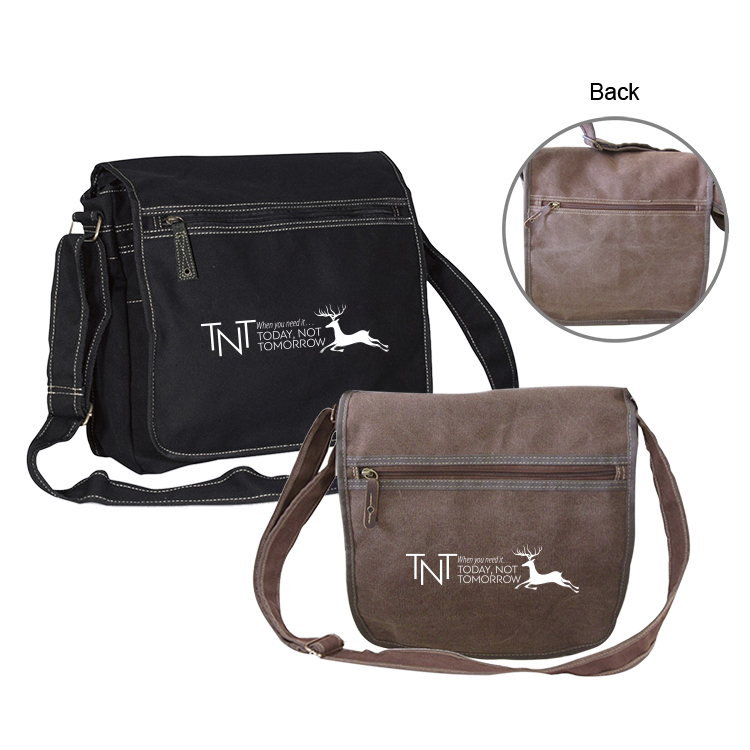 Made of 600 denier and metallic body, you can be sure of the durability of this bag. 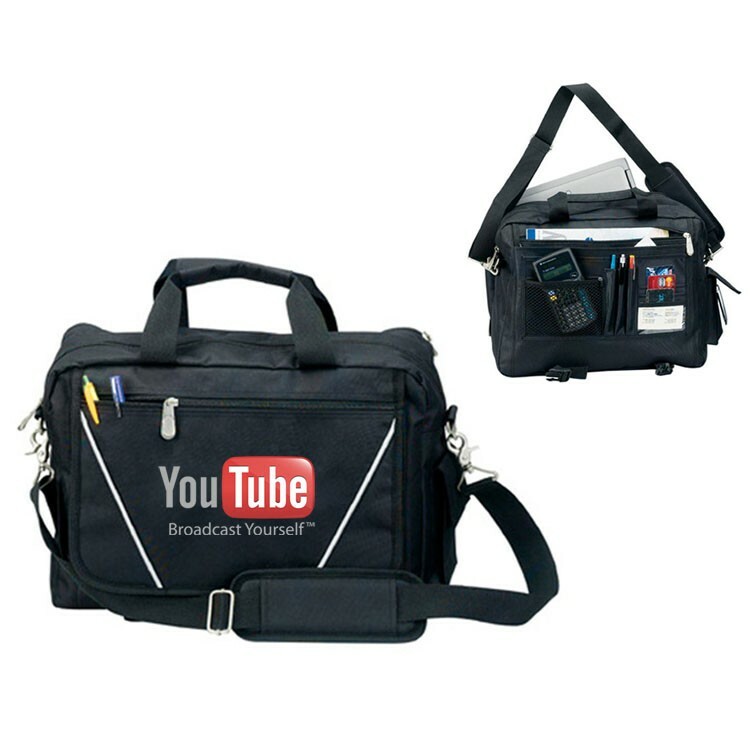 This is the perfect bag for students and professionals alike! Measuring 15", this notebook briefcase features a padded main compartment to keep your laptop or tablet safe and a front zipper pocket with organizer to keep things in order. Featuring an iPod port and adjustable/detachable shoulder strap this bag fits most laptops up to 15" and is perfect for most tablets. Made of 600 denier, metallic doby so you can be sure of its durability. 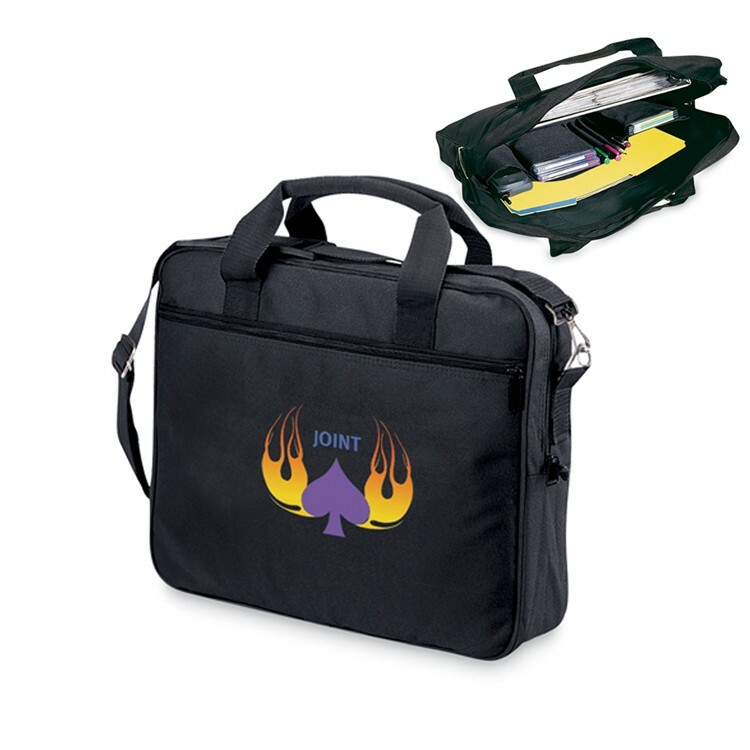 Here is the ultimate promotional briefcase! 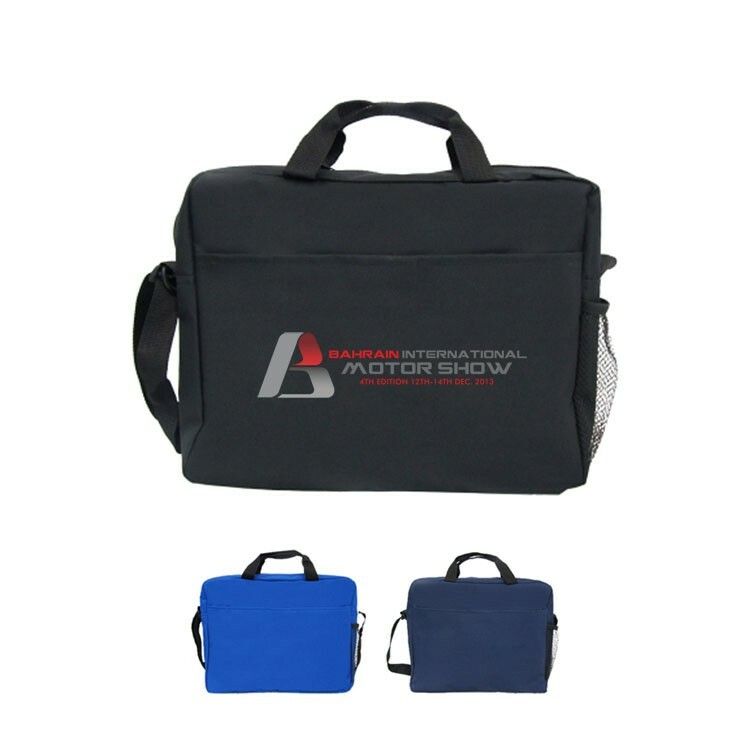 The Deluxe Computer Briefcase features a padded compartment for your laptop to keep it safe on the go. This bag has a front zipper pocket for your wallet or phone and a full organizer under flap for keep things in order. 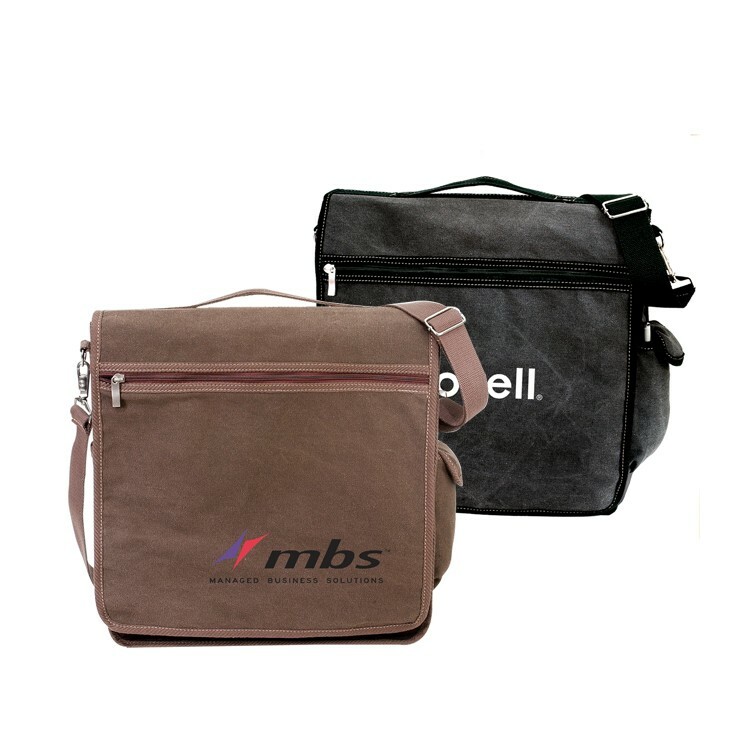 The adjustable strap, measuring up to 51'' with shoulder pad and heavy duty metal and high quality hardware make this bag both attractive and durable. Constructed of 600 denier. 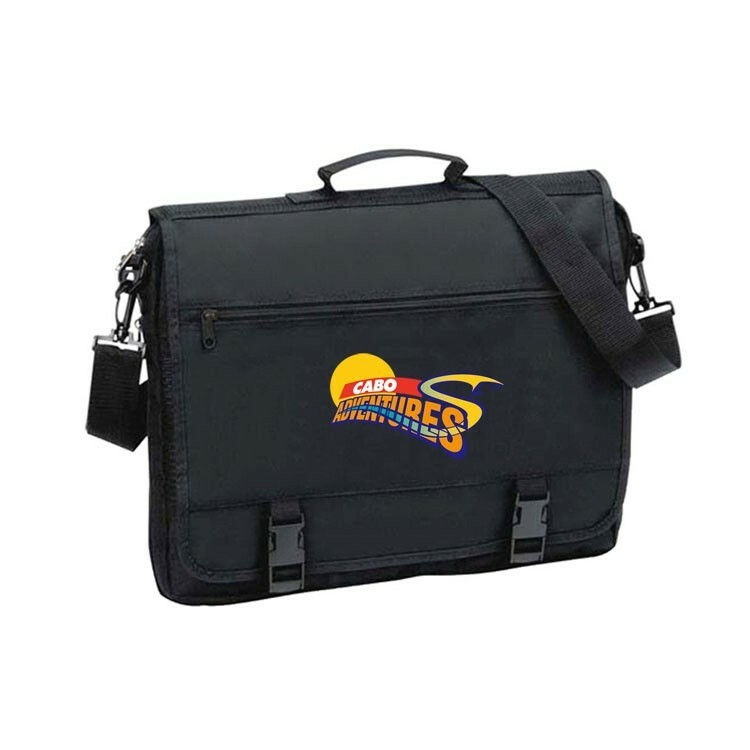 600D Polyester briefcase. Features zipper main compartment, open front pocket, interior pockets inside front pocket, pen loops, Rear ID window, carrying handles and adjustable shoulder straps. Imprint on back side is not doable. Adjustable and detachable sholder strap. 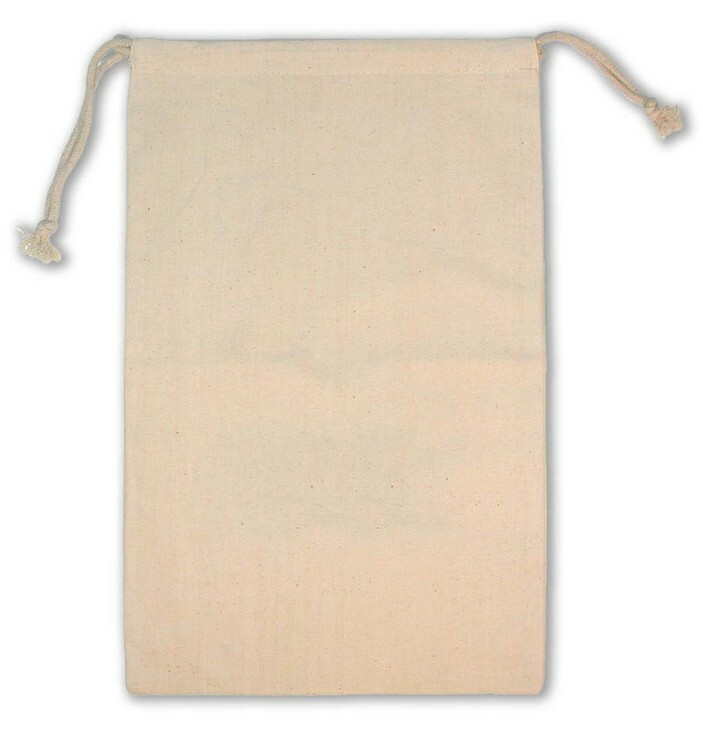 Bag expands to 6" wide gusset at the bottom with zip adjust width. Large main compartment, inside organizer under the front flap. Closing flap has zippered compartment 12" x 6". *Adjustable shoulder strap and top grab handle. 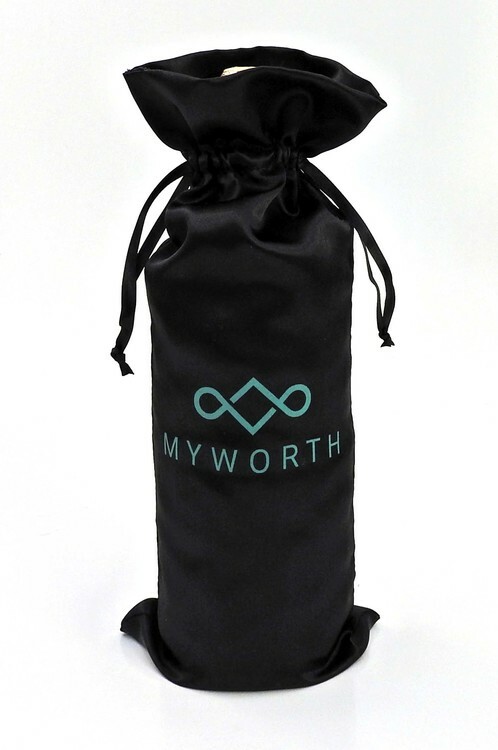 *Side mesh pocket for water bottle (water bottle not included.) *Front pen loop (pen not included). 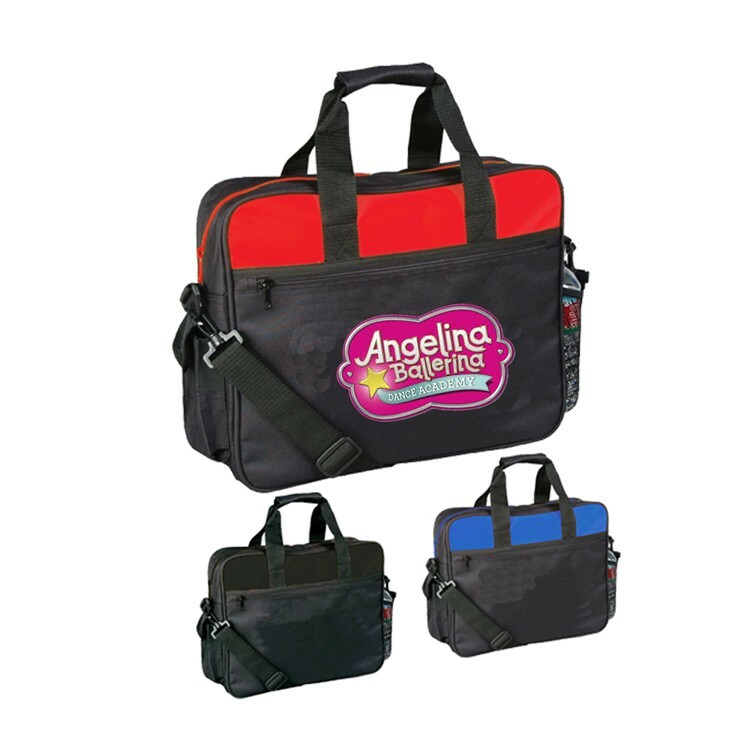 *Front flap with Velcro closure with interior multi-function organizer. *Non-PVC backing. *Strap Length Max: 38.5" and Min: 20"
The Budget Messenger Bag is ideal for professionals and students alike! This messenger bag has a front zipper pocket with an iPod port and an organizer under flap so you can keep all your accessories in order. There is a side mesh pocket for your water bottle and a Velcro closure. 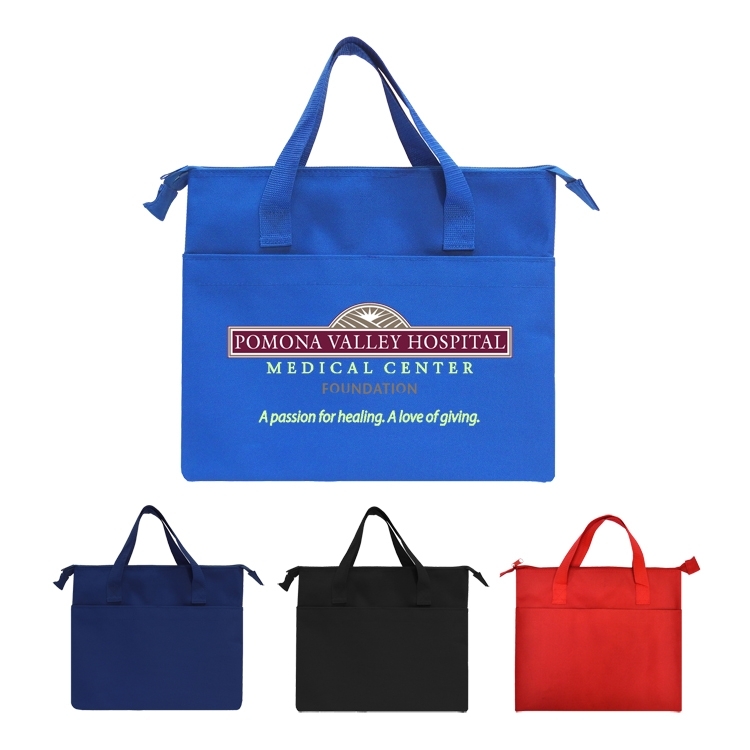 Constructed of 600 denier and non-woven polypropylene, this durable bag will last for years to come. The strap length measures up to 50''. 600D polyester breifcase. Features a Zipper main compartment, open front pocket, side mesh pockets & adjustable shoulder straps. 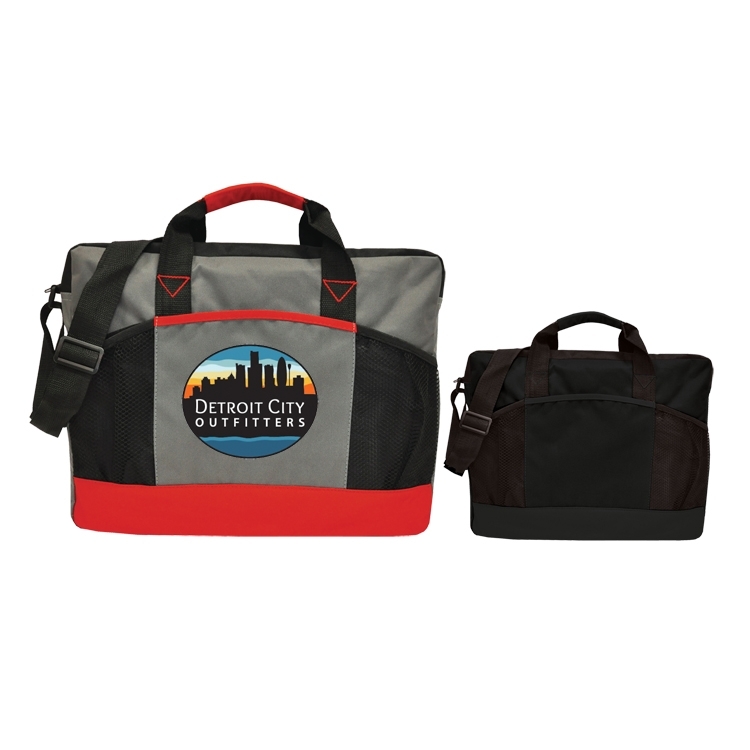 This City Messenger Bag features a front zipper pocket for easy access and a full organizer under flap so you can stay organized! The side mesh pocket and side open pocket are great for pens, pencils or even your cell phone. 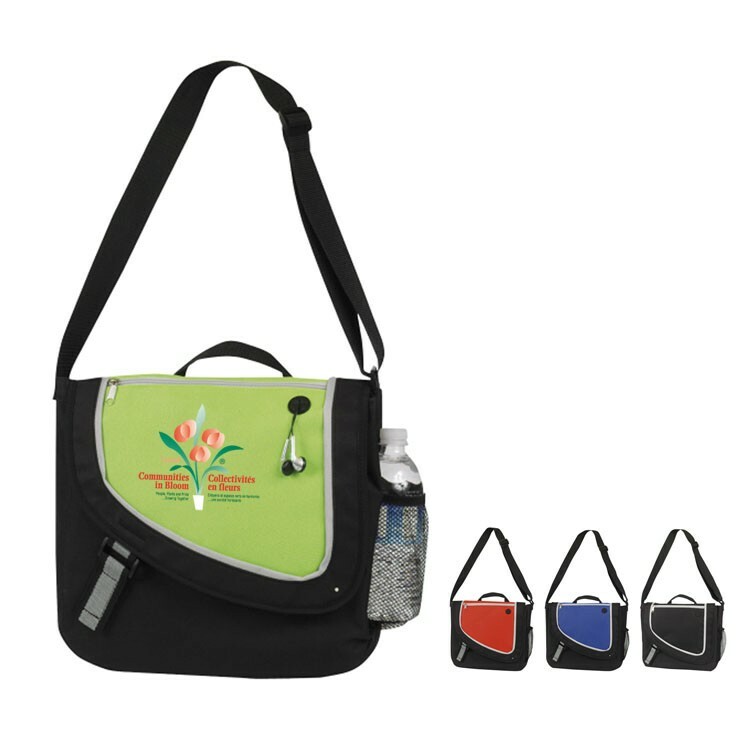 This bag features an adjustable shoulder strap, and iPod port so you can take your tunes on the go. 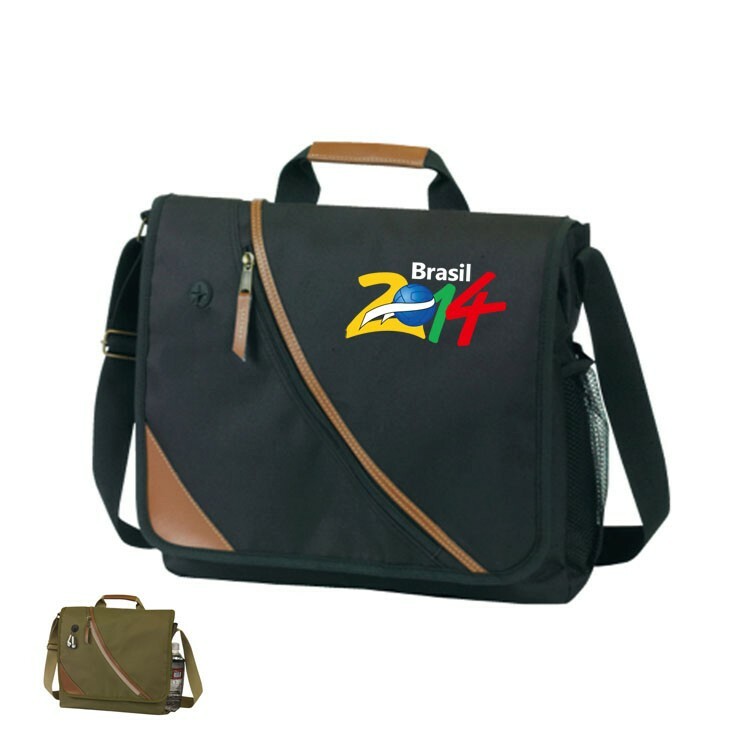 The adjustable shoulder strap has a length from 26'' to 50''. Made of 600 Denier with doby trim. 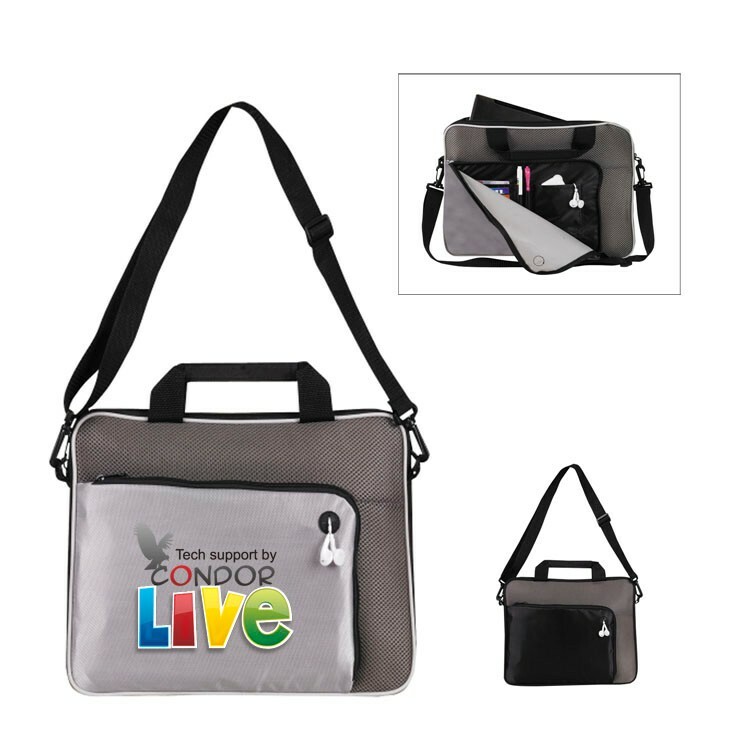 80GSM PET Non-Woven Fabric Dye Sub Full Color Messenger with adjustable Shoulder Strap. You can choose any background color or image with your logo.